The ProjectBaggee™is a flexible, hollow rubber ball, attached to a key chain which allows the storage of carrier bags or dog waste bags.“What amazed us was how lifelike the images were; from only having our preliminary sketches we now could really see how the product was going to look. Having absolutely no idea about how to go about this initially, Innovate were very helpful in filling in this vacuum!”Client: Jaq Croftwww.baggee.co.ukBaggee™ has a patent pending and is a registered design and trademark in the USA, Canada and Europe. The ResultsSince launching the product, Baggee™ has gone from strength to strength. The product is on the market, as is its sister product Doggee™ and is selling through their online store, as well as popular international retailer Marks And Spencer. 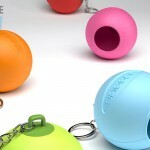 The product has also produced branded items for The Kennel Club, Crufts, and The Dogs Trust.